Anyone who isn't living under a rock should know that the Super Bowl was this past weekend, whether you're a football fan or not. It's a hugely popular event for getting together with friends, imbibing on delicious drinks, snacking on excellent foods, and watching football/commercials/the half time show--whatever floats your boat. I love all of the above. I don't really need an excuse to have a yummy meal while watching football, but it certainly doesn't hurt when it's your home team playing, and somehow, against all odds, they manage to win in the most unprecedented way, achieving the greatest comeback in Super Bowl history. Kind of a big deal, people. You can love or hate the Patriots all you want, but you gotta admit, they put on quite a show on Sunday, and it is likely one of the best Super Bowl performances in history. My heart was pretty much beating right out of my chest throughout the fourth quarter (and overtime), and I still need to pinch myself sometimes to confirm that it really turned out the way it did. It was pretty scary towards the beginning, but man oh man, we pulled off quite the victory! I'd like to point out the lovely sugar cane swizzle sticks from Hawaii. 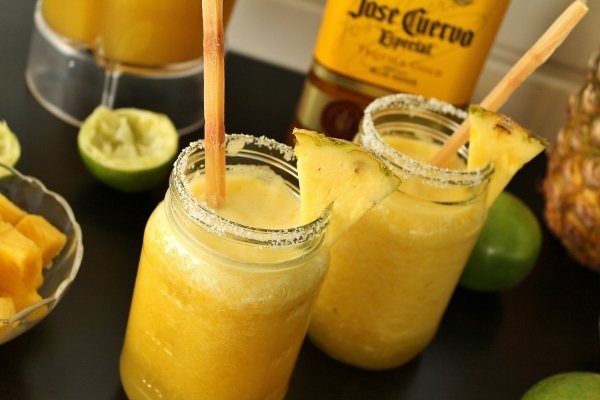 They were perfect for these cocktails. Thanks, twin! But this is a food blog, so let's get back to the Super Bowl menu. I decided to do a taco bar for our small and intimate Patriots-loving group. I created three different taco fillings as well as a couple homemade salsas, which I plan on discussing in an upcoming post. 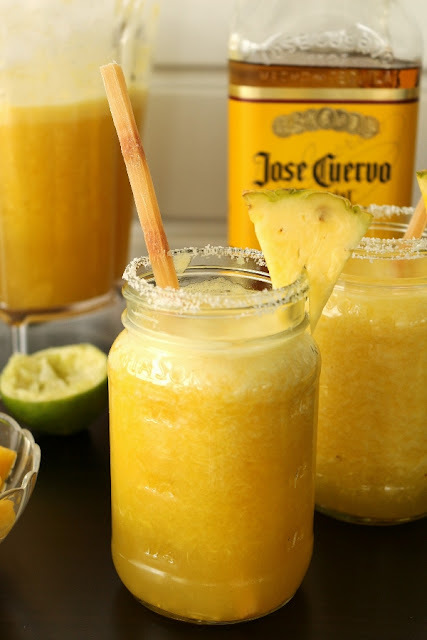 Today I would like to start by sharing the official cocktail of the evening: fresh pineapple margaritas. 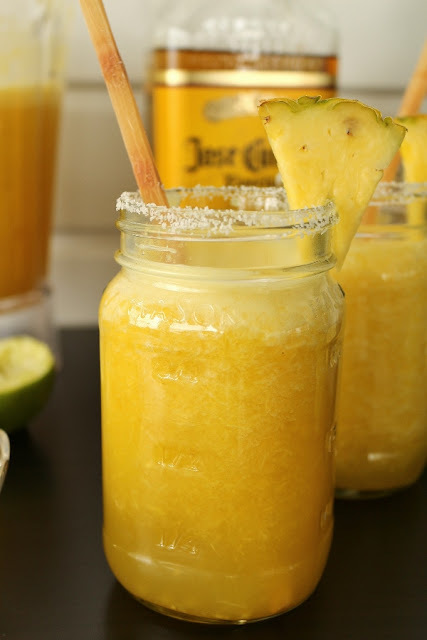 I knew that margaritas would be included in our festivities, but played around with a few different flavor options including hibiscus and tamarind, before decided to go with one of my tropical favorites: pineapple. 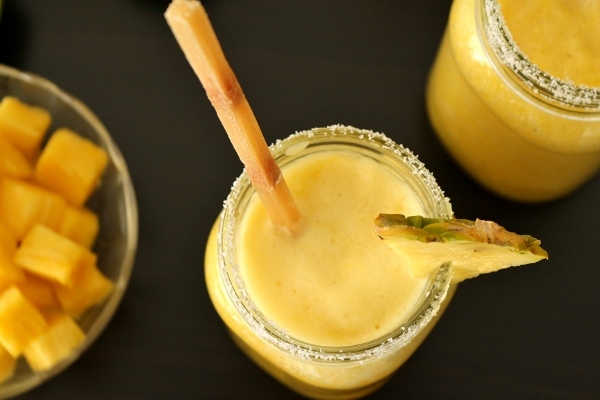 I was a little torn between taking the easier route of using store-bought pineapple juice (both honorable and delicious) and using fresh pineapple instead. I opted to go for the fresh pineapple since it felt a bit more special, but you can use an equivalent amount of juice if you'd prefer. Using fresh pineapple results in a slightly pulpy texture, but it definitely hits home with its freshness, and is worth it in my opinion. 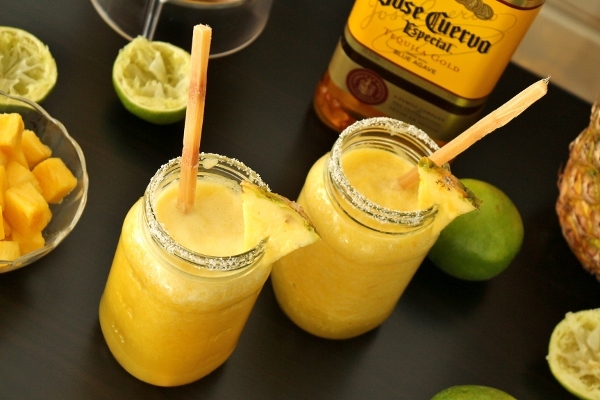 We absolutely loved these margaritas, and went back for seconds and thirds. 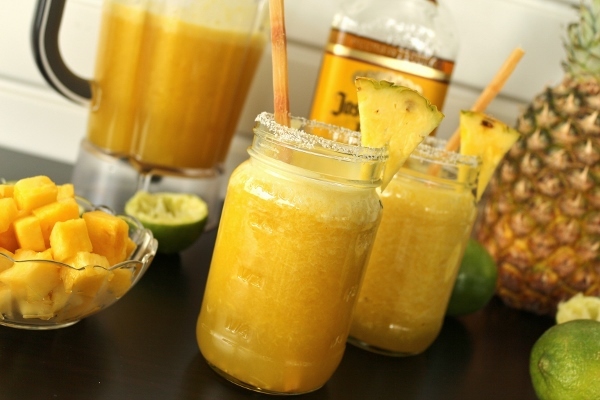 I had actually whipped up a double batch, which pretty much reached the capacity of my blender (I'd recommend sticking with a single batch at a time, and just blend up more as needed), and we drank every last drop. Whether you are noshing on homemade Mexican food, watching your favorite sporting event, or just kicking back and dreaming of warmer days, these fresh pineapple margaritas are the perfect escape. Stay tuned for more from my Super Bowl menu soon! 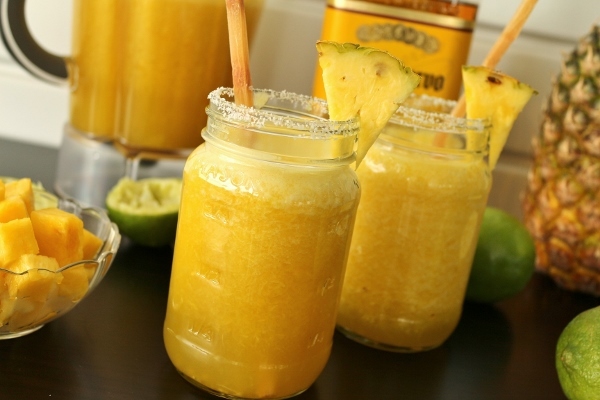 Place pineapple, lime juice, tequila, and triple sec in a blender and puree until smooth. 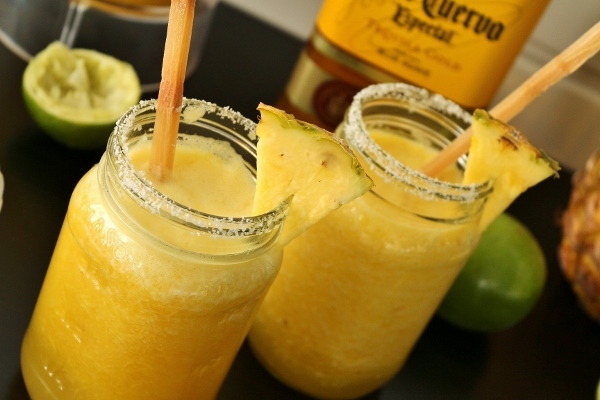 Serve immediately in salt-rimmed glasses over ice, garnished with lime or pineapple wedges. 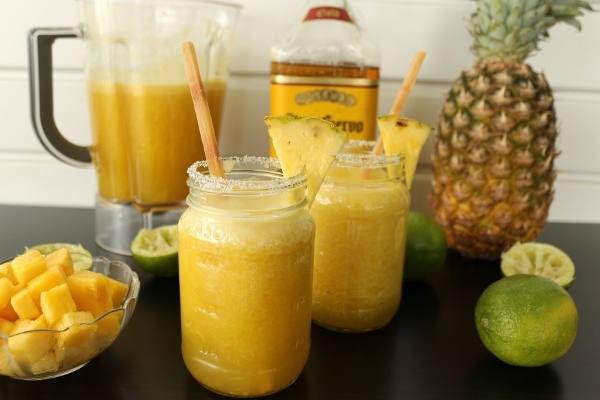 *Note* You can substitute 3 cups pineapple juice for the fresh pineapple, but it won't have the same freshness, and it won't have a pulpy texture (don't knock it till you've tried it). You also wouldn't actually need a blender in that case, and can simply stir the ingredients together in a pitcher.